It was not until the 1920s that cartooning became far enough advanced for the newly-founded English newspapers to employ pen-and-ink cartoonists. Artist Tony Velasquez led the way, giving us the first successful Filipino comic strip—Kenkoy—which he revived after the war. Many more followed in his footsteps, and these enduring funny characters they created are proof that cartooning is here to stay. 2. 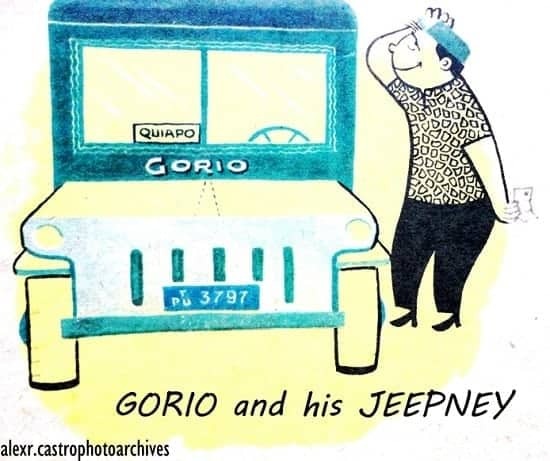 Gorio and his Jeepney. 3. Kosme The Cop (Retired). 6. Hugo, The Sidewalk Vendor. 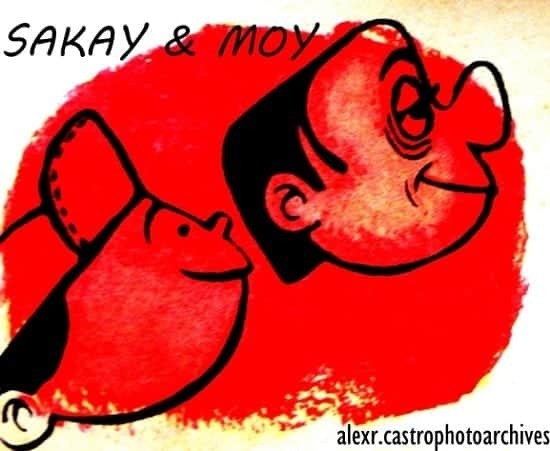 The popular duo of Sakay and Moy was first seen on The Manila Times pages in the early 1950s. It was conceived by Penny Patanne and advertising artist and illustrator, Higo Monzon. The source of humor revolved around the activities of Sakay and Moy with their run-of-the-mill neighbors and reflected the history of our rural manners. It was made into a movie with Cris de Vera as Sakay and Oscar Obligacion as Moy in 1962. The classic comic strip figures were also featured in stamps issued by the Philippine Postal Corporation in 2003, as a tribute to Philippine cartooning. Unlike other comic strips, Gorio offers simple humor and is neither topical or militant about socio-political issues. It simply amuses with Gorio’s daily trials on the road, politely dealing with passengers, motor problems and traffic officers—and at home, handling petty family squabbles. In 1962, a movie version of the comic strip was produced, with Chiquito in the starring role, and introducing Helen Gamboa. Alcantara, a gifted illustrator, is also well-known for his drawings that accompanied Philippine legends and stories published on the Sunday Times Magazine in the 60s. 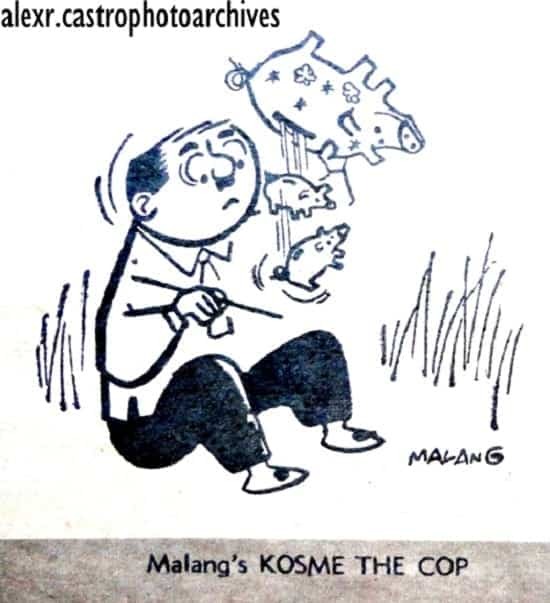 Kosme the Cop is a long-running comic strip without words, illustrated by Malang (Mauro Malang Santos). It first ran as a feature in the late 50s for 6 months in a magazine and was picked up by the Manila Times. The domestic and occupational travails of Kosme–directing traffic outside, while managing his domineering wife in the house–reflected the experience of typical Filipinos in the real world and their funny and oftentimes foolish solutions to extricate themselves from tricky situations. Bindoy, a latter-day Juan Tamad, was the creation of the famed writer E. Aguilar Cruz (who signed off as “Kabigting”) and illustrated by Salvador Cabrera, the elder brother of Bencab, and said to be the model for Bindoy. 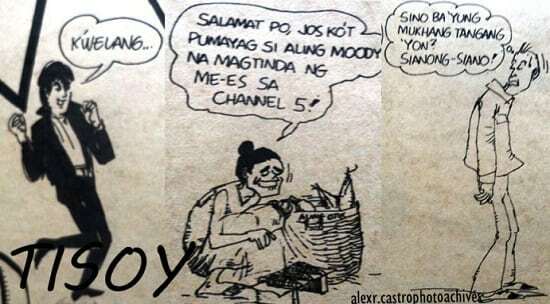 Bindoy was the first English-language comic strip with dialogues in balloons. Appearing in the Manila Times, Bindoy was a simple farm boy, too soft and simple sometimes, but always well-intentioned in his ways. A young artist when he drew Bindoy in the 50s, Cabrera also worked with oils, but he will always be known for his masterful drawings and illustrations. 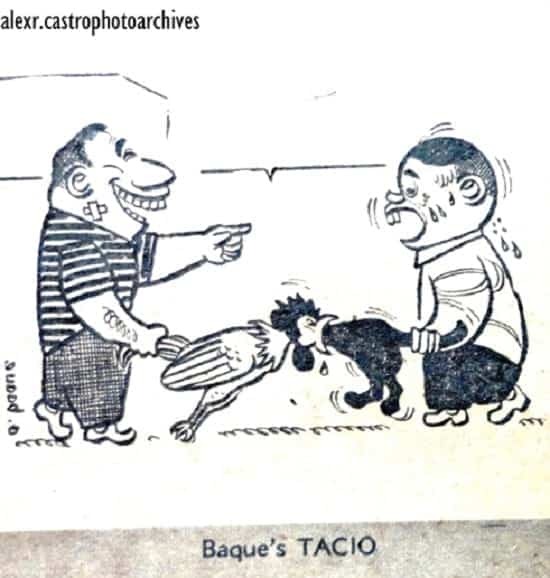 The big-toothed Tacio was drawn by the well-regarded newspaper cartoonist, Agripino Baque. Tacio represented the Filipino Everyman, and his amusing knack for responding to whatever life deals him. Tacio was popular enough to be turned into a 1961 movie, starring Oscar Obligacion in the title role. 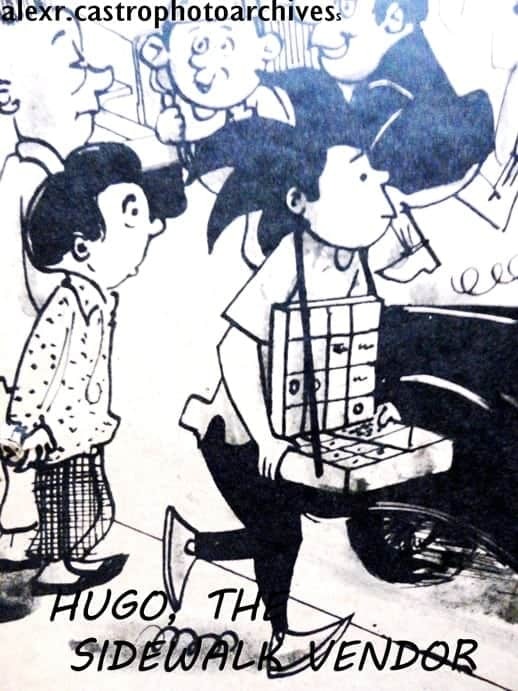 Hugo the Sidewalk Vendor was the brainchild of Danny Villanueva and illustrated by Roddy Ragodon who would go on to greater heights as a successful mainstream artist. Hugo was a peripatetic cigarette vendor with a trademark 5-pointed cockscomb mane. His frustrating misadventures on the street were followed by legions of readers, making Hugo one of the most recognizable cartoon figures of the 60s. His wordlessness only served to make the pains of his environment more acute. 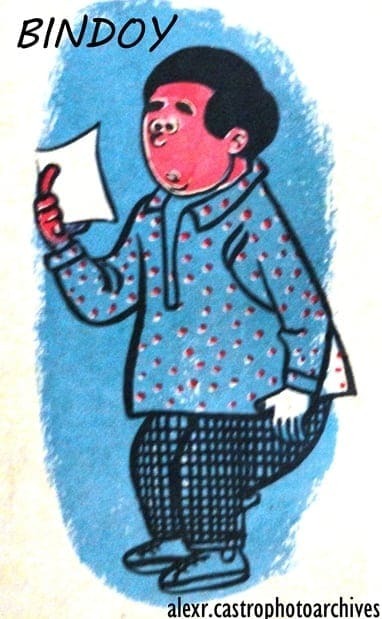 In 1962, actor Berting Labra was tapped to appear as Hugo in the movie version, which was widely received. The prodigious Larry Alcala, a U.P. Fine Arts graduate, began cartooning in 1946, even while in school. Islaw Palitaw had been his first strip that saw print in Liwayway after the war, followed by the even more popular Kalabog en Bosyo, a bungling pair of detectives. Started in 1947 on Pilipino Komiks, the characters “spoke” in Taglish, which was something novel at that time. 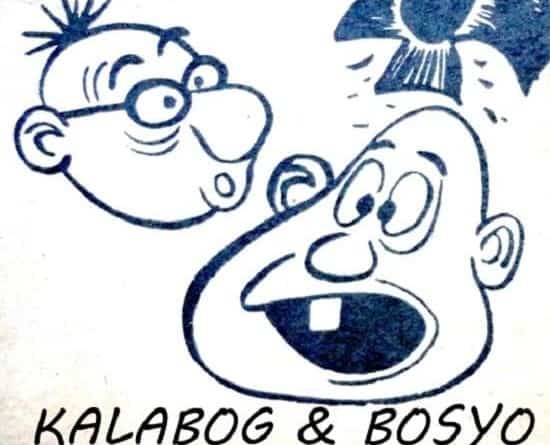 Kalabog en Bosyo would become the longest-running comic strip series in the Philippines, running for over a decade. In 1957, the strip was turned into a successful film by Sampaguita Pictures, with the inimitable Dolphy and Panchito essaying the roles of Kalabog en Bosyo. 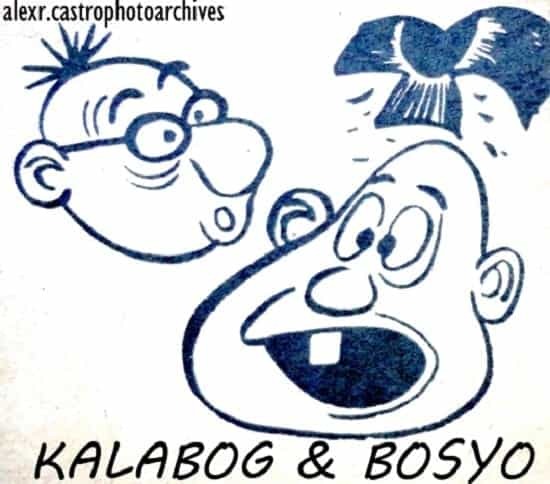 Another of Larry Alcala’s character creations that charmed Weekly Graphic readers from 1960-65 was “Mang Ambo,” the small-town Pinoy farmer from Barrio Bulabog who gave us slice-of-life exposés of the follies and frailties of Philippine society—in sophisticated English dialogues. All these he takes with a stride and dismisses with resigned laughter. 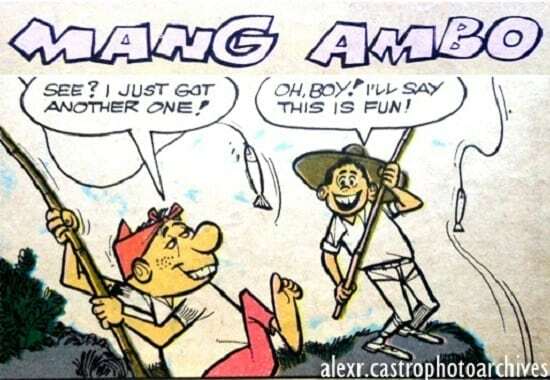 Mang Ambo was picked up by Weekly Nation (1965-72) and Manila Standard (1993-98) and was the first Alcala strip to be anthologized into a book. 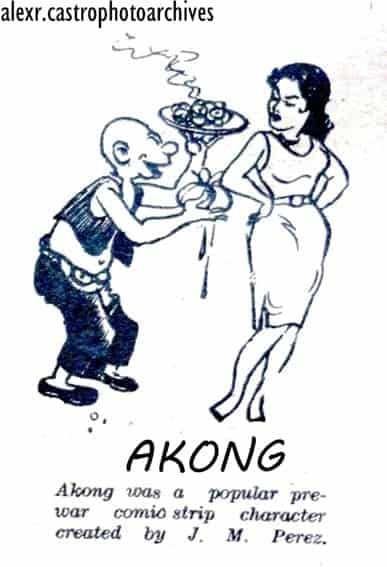 Akong was a familiar pre-war comic strip character created by Juan M. Perez and introduced in the series “Huwapelo” published in Liwayway Magazine back in the 1930s. Akong’s neighbor, Monang, was his secret love interest. The series was momentarily halted by the war years and resumed its appearance after the Liberation. Perez was also the illustrator-creator of other comic character tandems like “Pamboy at Osang” and “Tolong at Busya,” also for Liwayway. The pop culture icon “Tisoy” and his close-knit circle—his mother Aling Otik, love interest Maribubut, enfant terrible Caligula, aimless friend Cliff, social climbers Gemmo and Pomposa, among others–were the creations of Severino “Noynoy” Marcelo (1959 – 2002), an arts graduate from Far Eastern University. The characters made their debut on the pages of Manila Times in 1963 and struck a chord among Filipino youth with the way Tisoy plodded through life and its issues—finding a job; and dealing with peer pressure, poverty, societal problems, and political unrest—in an irreverent, and “bahala na” way. A TV series was produced in the late 60s which starred Jimmy Morato in the title role, supported by Pilar Pilapil (Maribubut), Moody Diaz (Aling Otik) and Bert Marcelo (as Tikyo), propelling his showbiz career. Cruz, E. (1957). Cartooning in the the Philippines. The Sunday Times Magazine, 10-11. Florendo, A. (1968). An Analysis of the Daily Comic Strips. Mirror, pp. 4-5.